Our pH Test Strips have small squares of paper, each prepared with a different indicator, attached to a thin but flexible plastic strip for improved handling. 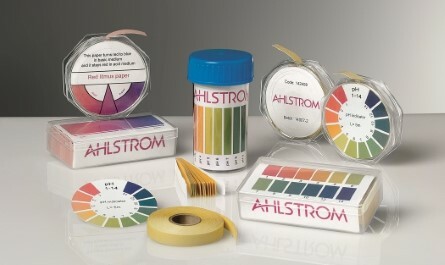 The pH indicator is strongly bonded to cellulose fibers to prevent bleeding of colors. This gives more precise measurement and also prevents contamination of the test solution. Reliable pH measurement can be achieved, even in weakly buffered solutions, and the test strips can remain in the test solution until the final reaction color is obtained.